Strip Arrows (Each) - $1 - Getting those old fletchings off an arrow can be pesky job. We’ll do it for you. 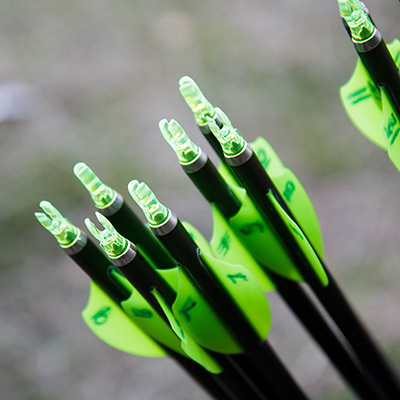 Fletch Arrows (Each) - $1 - Personalizing arrows for each archer is one of our favorite things to do! Cut Arrows (Each) - $0.50 - We can cut your arrows to any length. Reinsert Arrows (Each) - $1 - We take your insert that have come out and put it back in. Use of Shooting Machine - $50 - Our shooting machine will take the human error out of any test that you may want to perform. Whatever question you want answered, from arrow consistency to the importance of a sight level, this if for the analytical types who want mysteries solved. Paper Tuning - $30 - Do your arrows have a nasty kick to them when they leave your bow? Let’s fix it. Limb Changed Out and Installed - $20 - Your bow limbs are where your poundage comes from. Sometimes you might need a new set of limbs to lower or raise your peak poundage. Sometimes we will need to get a warranty set of limbs installed on your bow. Either way, we can do it. Cam Installed & Timed (Two Cam/Hybrid Cam) - $20 - The cams on your bow store energy and help produce your draw length. If you need some new cams installed come see us. Fix Creaks by Lubrication - $20 - When limb bolts and axles get dry or rusted, those nasty annoying creaks and squeaks show up. Let us break down your bow and eliminate them. Replace Bearing - $20 - Does your bow not draw smoothly anymore? The bearings have lost all the lubrication. Let us break the cam down and replace the bearings. Cam Installation (Solo Cam) - $10 - Most Mathews bows requires a cam change out for each separate draw length. Cam Timing & Draw Stop Sync - $10 - Two cam bows requires eccentric timing. If a two cam bow is out of sync, one of the cams throws before the other. This is hard on the strings and bow parts and causes erratic arrow flight. If you’re concerned, bring it in and let us check it out. Accessory Installation (Each) - $10 - If you need some accessories installed, don’t be shy, we can make sure they are installed properly. Reserving (Per Location) - $8 - Lots of shooting causes servings to wear out. Center serving separation will move your nocking point causing your bow tune to decay and accuracy to decline. Cam serving separation exposes your string causing strand breakage. If your servings are looking rough and your strings are still good, come on in and we will fix you up. Drop Away Rest Tie-In - $8 - It is necessary that your drop away rest is tied in and timed perfectly for optimum performance. Draw Length Adjustment - $5 - The most important ingredient to shooting lights out is a perfectly set draw length. Draw Weight Adjustment - $5 - Not being able to pull your bow comfortably will cause your form to mis-align. THis causes a very unstable sight picture and leads to poor shot execution. 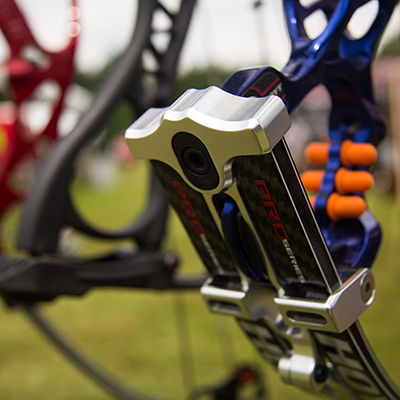 Make sure your bow is set at a comfortable poundage. We use digital scale for precision draw weight adjustment. 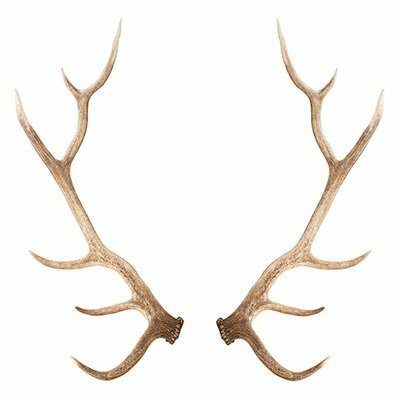 Peep Tie-In - $5 - Make sure your peep sight is tied in good! One of the biggest causes of long term inaccuracy is a peep that slowly moves up or down because it is not tied in properly. Chronograph - $5 - It’s always a blast to know how fast your bow is shooting. We can check the FPS (feet per second) of your arrow. Bow Work Minimum - $5 - If the work you need on your bow doesn’t fit any description here, then it’s probably small potatoes and we can do it for 5 Bucks. The Works - $150 - The big kahuna of our work. The works includes a total detailed cleaning of everything and an advanced tune-up to top it off. Bow Set-Up with Basic Tune-Up - $90 - If you bought your bow somewhere else you kinda made us sad, but your success is still the very reason for our existence. So bring in that bow and let us make it shoot the very best it can. We will set it all up and give it a basic tune-up for you. Remember, if you buy your new bow from us we throw in this job for FREE! Advanced Tune-Up - $80 - First we start with a complete basic tune-up. Plus we clean and tube the cams and the limb pockets. Then we paper tune to perfection and chronograph just for fun. Basic Tune-Up - $40 - There comes a time when a bow needs some TLC and re-start. It’s called a basic tune-up. We use tooling to set center shot, nocking point height, tiller, poundage, draw length, and cam timing. Then we wrap it up by waxing and conditioning the string set. Full String Set Installation - $25 - It’s always fun and refreshing to re-string your favorite bow. Just like breathing new life into it. Cable/Cables Installation and Timed - $20 - Sometimes the cables give out before your shooting string. Although an uncommon job, we are here for you. String Installation (High Performance) - $15 - It can happen, that your cables are still good but your string has taken abuse, accident or otherwise. This is the job to replace just the string. String Installation (Dacron) - $10 - For those who still love shooting those oldies but goodies, we will always be able to change your bow string. Wax & Condition Strings - $5 - If your string set looks dry and thirsty, bring it in and we will wax and condition it, making it look new and shiny again. Deposit required? 25% of total ticket including tax. What if I cancel my layaway? A refund will be given, less a 10% restocking fee calculated from the total ticket price. Deposits made with a credit card will be refunded to that same credit card. What if I want to keep a layaway but change the merchandise on the layaway? There would be no restocking fee if you wish to change the merchandise you have on layaway. Your full deposit amount will be transferred to the new layaway. Do you have a bow or items you need to sell? 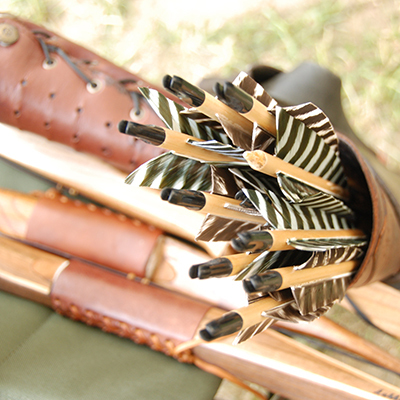 We offer a consignment program to help sell your used bow or item. 20% consignment fee when the bow or items sells. 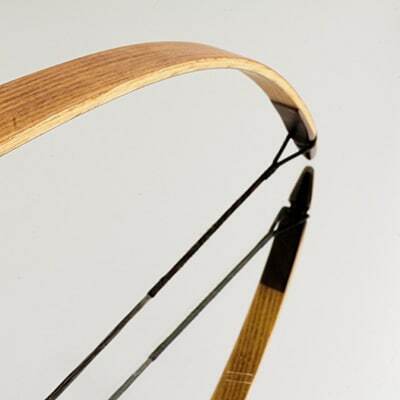 Set a price for your bow, we will display and sell it for you. You may adjust the price of your bow at any time. We will notify you when your bow or item sells. Come pick up your check minus the consignment fee. Consignment space is limited. Call or stop in for availability.